Jean-Bosco Murabukirwa who has a total flying time of 12 000 hours and rated on 19 aircraft, is member of the presitgious FAA Airmen Certification Database. "The Federal Aviation Administration (FAA) is recognizing Jean Bosco Murabukirwa with inclusion in the prestigious FAA Airmen Certification Database. The database, which appears on the agency's website at www.faa.gov, names Murabukirwa and other certified pilots who have met or exceeded the high educational, licensing and medical standards established by the FAA. Transportation safety experts strongly recommend against flying with an uncertified pilot. FAA pilot certification can be the difference between a safe flight and one that ends in tragedy". The first time Jean-Bosco Murabukirwa entered a plane, he was 11 years old. His father took him to the cockpit of a Boeing 707. “The Belgian captain offered me a cake and I was able to watch every single detail. As a little boy I looked up to this captain, wishing I sat in his place,” Murabukirwa recalls. Forty years later, the little boy’s dream came true. 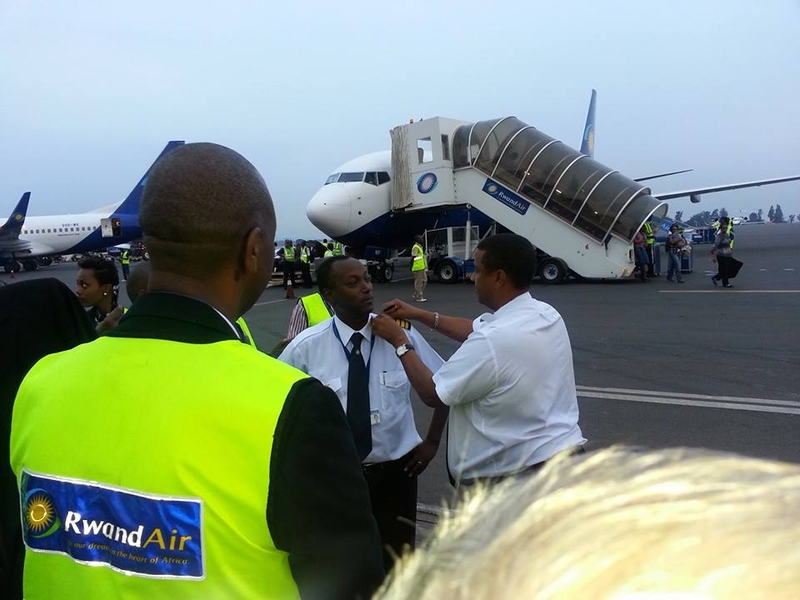 Murabukirwa is Rwanda’s first flight captain. The ever smiling father has not only traversed the skies across the world but is now on the top of his career. Born in 1963 in Burundi, Murabukirwa’s father worked for a Belgian aid agency before returning to Rwanda in 1967 where he became the commander of the Kigali airport, director of civil aviation and, later, director of meteorological school. For his commitment to Rwanda’s aviation, he won the ICAO gold medal at the end of his career. Right from his childhood, Murabukirwa says he never dreamt of anything else other than working in aviation. His family, friends and hobbies are all connected to aviation. “I grew up at airports with planes and that is what has made my life,” he says. After completing a course in management and administration at the University of Rwanda (Huye campus), Murabukirwa enrolled for aviation training at the Wilson Airport in Nairobi, Kenya. He later left for New York and Texas in the United States of America to become a junior pilot in 1989. On coming back to Rwanda, he could not secure a job. “It was a difficult moment for me but I did not give up. I decided to leave Rwanda again,” Murabukirwa says. For over five years, Murabukirwa flew charters in Nairobi, Kinshasa and Goma. In 1995, he returned to Rwanda and flew for “Air Rwanda” the then national airline before it was renamed RwandAir in 1996. After its degradation in 1997, Murabukirwa was rendered jobless again but he kept going. He believed in his flying skills and the degradation of his former workplace opened new horizons for the young pilot. Murabukirwa founded his own company for regional charters called Atlas Air in the same year, 1997. After three years, he got an opportunity to fly VIP charters for the Rwanda Airlines. Flying over all the beautiful sceneries of the world made Murabukirwa gain a lot of experience and exposure. His life is a mixture of cultures he has gathered from people all over the world. “I listen to Cuban music, prefer eating Asian food and I love the relaxed people of Los Angeles,” he explains. Murabukirwa has traversed the whole of the Middle East and has been to 15 states of the US. He even possess a Canadian Greencard. But he refused to live in Canada, and in 2010, parked his bags and returned to Rwanda, to work for RwandAir. “I have toured the whole universe. I have seen so many exciting, changing faces of the world. I could stay in every country I liked, but Rwanda has something unique and it is why I kept coming back,” he says. He explains that Rwanda’s culture characterised by high levels of respect, dignity and integrity makes the country different from others. “It does not matter how high I fly and where I fly, I remain Rwandan and I am proud of that,”Murabukirwa says. The flight captain showed The New Times his working schedule. He rests for two days a week, the rest of the days and nights he is either flying or preparing to fly. Murabukirwa clarifies that a flight does not only consist of the hours you are in the plane, but begins the evening before. “You have to be ready all the time and you need to develop your own rituals. For example, I do not attend any social functions the day before a flight,” he says. When entering a plane, the captain has to be in contact with his whole team. Once in the air, the captain and the pilot have to act as one team. “You have to keep the other one awake and, over time, you learn how to tell stories,” he says. Murabukirwa says preparing passengers for the flight is an important aspect before debarking, adding that his long experience has made him to a psychologist of sorts. “Many people are afraid of flying. I always tell them that a plane is the most reliable means of transport,” he says. “We have to release the tension in the plane so that everybody can enjoy the beauty of flying,” he adds. Murabukirwa says it is important that Rwandans be proud of their airline, RwandAir. He intends to use his skills to ensure that RwandAir excels. Murabukirwa also urges Rwandan pilots to work hard and profit from the good market and government support. Also being able to fly the executive and expensive airplanes of RwandAir is a great feeling, he says. “We can fly around the world starting from Rwanda,” says the flight captain. RwandAir has appointed Holiday Aviation as its GSA in South Africa.